A few hours ago, I saw Star Wars: The Last Jedi and now I feel like writing a brief post about it. By the way, if you’re avoiding spoilers, I promise there will be no major ones. As you may be aware, I am a big Star Wars fan, but to be honest, I found The Last Jedi to be disappointing. It has a very simplistic plot, yet it is packed with so many elements that it ends up being a confusing mess. It has a bit too much misplaced humour. It introduces characters that really don’t add anything to the story. It has a very long subplot that ends up going nowhere. And the result of all this is that the main plot, Rey’s story, is lost, along with a lot of that special Star Wars feel. In fact, at times I asked myself if I was actually watching a Star Wars movie at all. So was there anything good about The Last Jedi? It had a few exciting action pieces, but nothing that really stood out. I guess at least it didn’t fall into the trap The Force Awakens did and set out to emulate any of the films of the original trilogy. Having said that, though, there are some obvious connections to The Empire Strikes Back at both the start and the end of the film and also in the idea of the bad guys relentlessly pursuing the good guys. Of the three Disney-produced Star Wars films so far, the one I like best is without a doubt last year’s Rogue One and the one I like least is this one. But I have feeling that worse may be yet to come, especially since The Last Jedi‘s director, Rian Johnson, has been signed up by Disney to make an all new Star Wars trilogy. I hate to say it, but I don’t think It’s a good time to be a Star Wars fan.😪 Which leads me on to an interesting thought that occurred to me while I was writing this post. If you pretend The Last Jedi is an analogy of the relationship between Disney (the First Order) and Star Wars purists (the Resistance), I think it sums up the current state of the Star Wars franchise quite neatly. I wonder if anyone agrees with me? 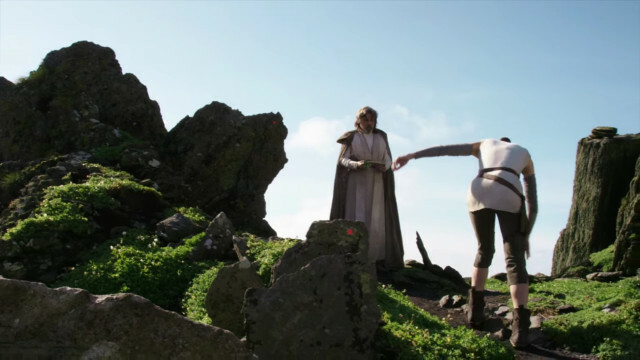 This entry was posted in Impressions, Western Films and tagged Star Wars, The Last Jedi by maruserino. Bookmark the permalink.